Dear Kaia: Happy 5th Birthday, Kaia! OK, well, I know that I've had a few practice birthdays before today, but this is it! 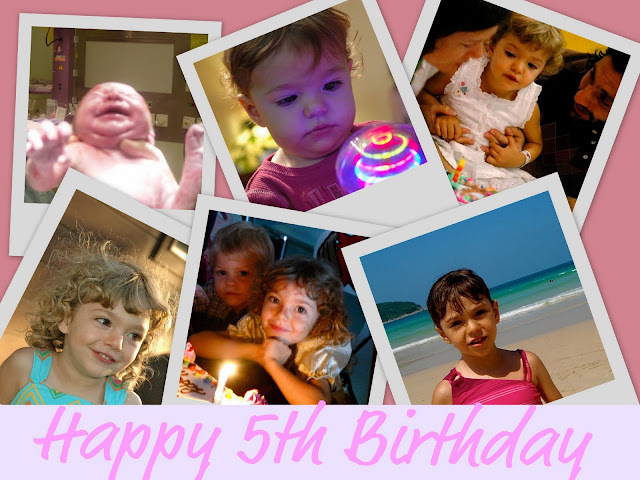 My REAL birthday, and I am actually five years old now! I had a great day! This morning, we went to the beach, and the water was perfect! Mommy said that the ocean knew it was my birthday and was helping me have a great day. The water was so calm that we all had a super fun time swimming, even Skyelar. Then, we went out for dinner. I got to choose, and I chose my favorite place, Nikita's Beach Bar. I really like their pizza and pineapple juice! THEN, we went to an overlook to watch the sun go down. It's a really pretty view. I hurt my ear on the way, though, so I didn't get my picture taken with the sunset. Finally, on the way home we stopped and got a piece of cake so that I could have ONE last candle to blow out. It has been a fantastic birthday! Thanks, everyone, for all of the birthday wishes! I miss all of you!